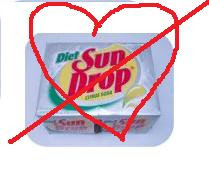 I don't know if I ever told you all that I have given up Diet Coke and Diet Sundrop. I have read many studies about drinking diet drinks and being fatter than people who drank regular sugary drinks. Well I have been off Coke and Sundrop completely for just over a week. This may be the best thing for my body but I have really been paying for it. By giving up the diet coke I have also given up most of my caffeine. This has caused a headache for the last 10 days in a row. Other than that I cannot tell a real big difference. I do know that if this keeps up for much longer and I am not able to tell a difference then I will go back to drinking my multitude of Diet Coke and Diet Sundrops daily. Also, I just have to tell you all. I am a big fan of TV and with all these stupid season finales that I think I have to watch my sleep has been struggling. Making it really hard to get up for that morning workout. But you all know in 2 months when there is nothing on TV I will be complaining about the new seasons of things starting. That's like complaining its hot in the summer and cold in the winter. Still cant do anything about it. Finally, I have my Dr. Ortho appointment tomorrow to get the results from the MRI. I will let you guys know what they find out. I'm going to the gym tonight and in the morning just in case he says for some reason I cannot workout. I really don't think he should, its been hurting this long and I have been just fine working out on it. Ill let you know.